sits Basildon Park, never fully completed, the house passed through a succession of owners. In 1910 it was standing empty and in 1914, it was requisitioned by the British Government as an army convalescent hospital. It was again sold in 1928 and quickly sold again. In 1929, following a failed attempt to dismantle and rebuild the house in the USA, it was stripped of many of its fixtures and fittings and all but abandoned. During World War II, the house was again requisitioned and served as a barracks, a training ground for tanks, and finally a prisoner of war camp—all activities unsuited to the preservation of an already semi-derelict building. In 1952, a time when hundreds of British country houses were being demolished, it was said of Basildon Park "to say it was derelict, is hardly good enough, no window was left intact and most were repaired with cardboard or plywood." Today, Basildon Park is as notable for its mid-twentieth-century renaissance and restoration, by Lord and Lady Iliffe, as it is for its architecture. In 1978, the Iliffes gave the house, together with its park and a large endowment for its upkeep, to the National Trust in the hope that "The National Trust will protect it and its park for future generations to enjoy." Following the donation of Basildon Park to the National Trust, Lord and Lady Iliffe remained as tenants, eventually converting the mansion’s former laundry wing into a self-contained house. Lord Iliffe died on 15 February 1996, his wife died, at Basildon, aged 90, in 2007. 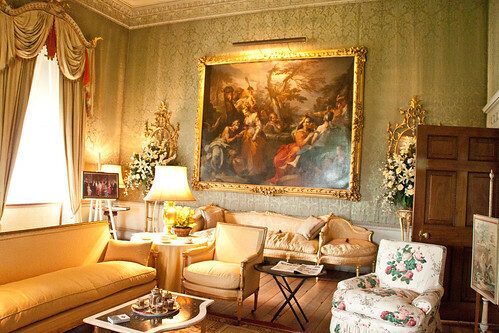 The picture on the easel in the foreground depicts a scene from a Christmas Special of Downton Abbey, when Basildon Park stood in for the Crawley’s London home.